This ride is a showcase of some great scenery in South Gippsland including excellent coastal views. 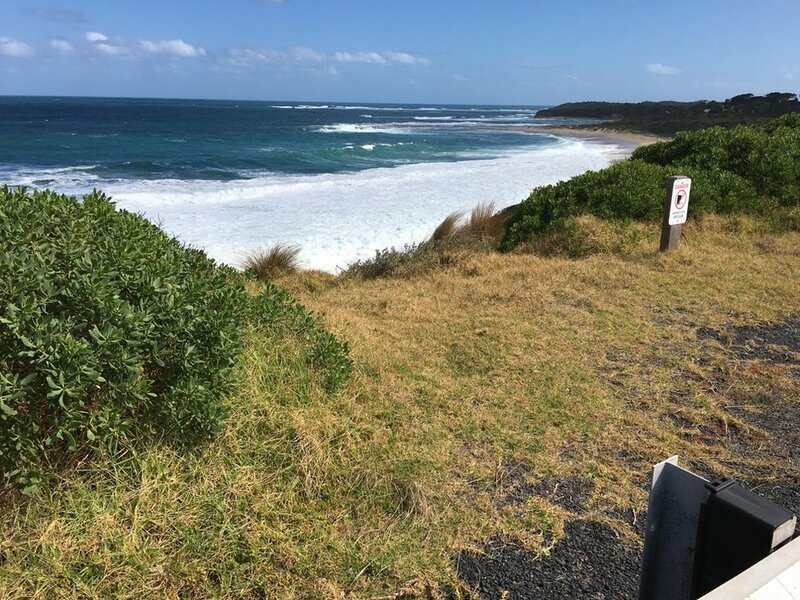 It starts at Kilcunda and follows Bass Coast Rail Trail to Wonthaggi for 13km before travelling by road to Cape Patterson for 9km and along the coast road to Inverloch for 12km. The roads are quiet outside holiday times. This ride starts at the coastal hamlet of Kilcunda along the Bass Coast Rail Trail initially following the coast. The railway line was a former branch line from Nyora to Wonthaggi, opened in 1910 to service the coal mines and bring passengers and farm produce into the area. It travels through heathland and farms. Soon after you set out you will cross the historic trestle bridge that spans Bourne Creek. To get the best view of the bridge from the trail, stop at the start of the bridge and walk a few metres down a rough track on the right. The ride continues along the back of sand dunes then turns inland through the rural farmland towards Wonthaggi. Just off the trail is Victoria’s Desalination Plant. You can get a view of this by taking the short side trip described below. Wonthaggi was once a coal mining town and on the way, just before South Dudley Road there are stands of pine trees, remnants of the coal mining days of the State Coal Mine. You can clearly see the Mine Rescue Station. Wonthaggi is a good place for lunch. A little further along the rail trail you will find Wonthaggi Railway Station, now in use as a community centre. You then ride to Cape Patterson, before riding along the Coast Road to Inverloch. Coast Road has five lookouts (see Weekend Notes for full details). These provide some spectacular coast and ocean vistas. In particular Eagles Nest is well worth visiting. The coastline and sea on the coast road are part of the Bunurong Marine and Coastal Park. Fossils of dinosaurs have been discovered in the cliffs along this coast. Inverloch is a thriving coastal holiday resort. There is plenty of accommodation at Inverloch if you want to stay for a few days. If you have time in the morning, the Kilcunda general store serves excellent coffee. There are public toilets at the Kilcunda car park. There are public toilets in Wonthaggi in Apex Park at the end of the Rail Trail. There are plenty of bakeries and cafes in Wonthaggi. “Beand” in Graham Street is a good one. There is also a café and toilets at the State Coal Mine. There are cafes and toilets at Inverloch. There are no toilets between Cape Patterson and Inverloch. The trail from Kilcunda to Wonthaggi is fine gravel with a gradual rise to Wonthaggi and is easy riding. From Wonthaggi it is road riding. If it is not in the holiday period the road is usually quiet. It’s a long gradual uphill ride to Cape Patterson. From Cape Patterson the road has a few hills but nothing too daunting. The prevailing wind is a south westerly which usually helps you along. Kilcunda is a bit less than 2 hours from Melbourne. You can’t take your bike on the V-Line bus so you will need private transport to take the bikes to Kilcunda.. If it is not in the holiday season there is usually plenty of parking at Kilcunda. You can leave vehicles there for the day. It’s possible to arrange for a maxi taxi to take you from Inverloch back to Kilcunda. Or you can catch the local bus back to your car and drive to Inverloch to fetch your bike. At the end of Eagles Nest. Start at the car park at Kilcunda. When you get to Lower Powlett Road you can take a diversion to the Wonthaggi Desalination Plant. See the Variation below. Continue along the rail trail till you get to Wonthaggi. There are toilets in Apex Park. Ride south through Apex Park cross Murray Street and ride along Mc Bride Ave carefully crossing Graham Street to reach Watts Street. Turn left into Billson Street and continue riding. Billson Street turns into the Cape Patterson Road. Continue along the Cape Patterson Road to Cape Patterson. Before you get into Cape Patterson proper turn left onto the Cape Patterson-Inverloch Road. Follow this road to the intersection with Surf Parade. The Cape Patterson-Inverloch Road turns in to Toorak Road at this intersection. Turn right at Surf Parade and follow this road. After the Surf Club as you approach the town there is a new concrete bike path that take you the rest of the way into Inverloch township. At Kilcunda, ride up the apex of the ride and take off to the left to find the Bass Coast Trail. 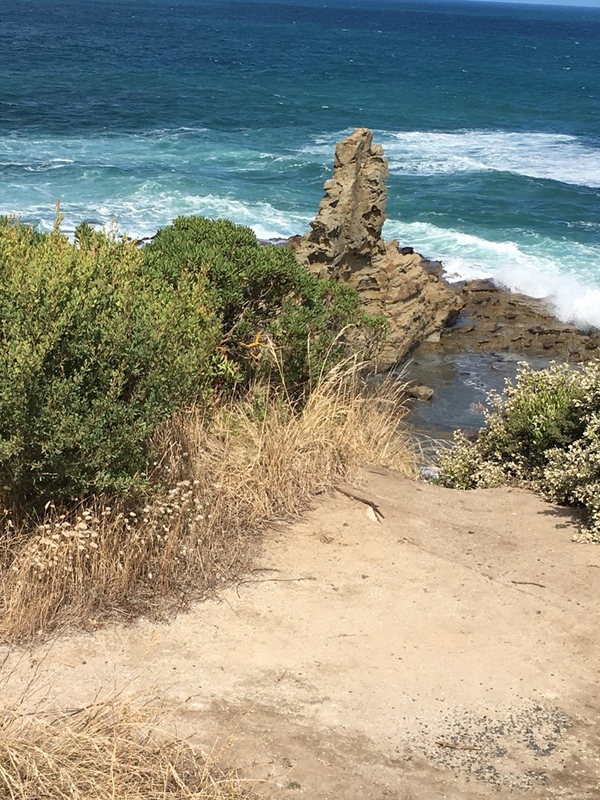 It is possible to ride along this very scenic cliff top walking trail for a kilometre or two before returning to the rail trail. Continue on the rail trail to Anderson (4km) up a steady incline (see Bass Coast Rail Trail). This has great views of the coastline. Continue onto Anderson and then follow the shared path to San Remo (12km). This shared path has some short and very sharp inclines and descents. When you get to Lower Powlett Road, leave the rail trail and turn right. Ride 2.6 km along this road to the Wonthaggi Desalination Plant turn off. Ride back to the rail trail and resume the ride to Wonthaggi. You can start the trail at the Woolamai Recreation Reserve on Trew Road.